We can read on and see how the children of Israel professed to choose with Joshua. Now, are we truly choosing to serve the Almighty God, or are we in some way serving some other god? The majority may profess to serve the Almighty, but the majority will not truly choose to serve Him, according to Scripture. Many people are serving another god by disobeying the True One and, instead, obeying their particular church, bishop or other leaders; or even the leaders obeying the majority of their people instead of God, like Saul did when he obeyed his people rather than God. Please read 1 Samuel 15:19-24. Some church leaders quote this Scripture to get their members to obey them or the rest of their church, thereby setting themselves and their group in the place of God. Saul actually obeyed his church and disobeyed God; although some of God’s commands he obeyed, but not all. How easy can we do the same thing as Saul did, without thinking about it; disobeying God in even just one point in order to be popular and well-thought of among our people, thereby falling into idolatry, having our church as our other god? It seems to be very easy for us human beings to tend to have some kind of a visible god rather than the True One who is not visible to us. For example: It can become such a routine or habit for us to confess our failures and sins to a church group and somehow depend on the church or leaders to forgive our sins, thinking that we have to have a human bishop between us and God in order to have our sins forgiven. And finally, and very dangerous, we can even forget to ask our Heavenly Father for forgiveness, who is the only One who can forgive our sins through His Son. We have one mediator between us and God; not our church leaders, but Jesus Christ. “For there is one God, and one mediator between God and men, the man Christ Jesus.”(1 Timothy 2:5)We should confess our sins and make things right to whomever we have done wrong, but let us not forget to make things right with God and ask Him for forgiveness. If we are truly baptized into Christ and keep our baptismal covenant with Him, we will serve and obey Him. But if we are baptized into a certain church group and have made a covenant or vow to obey them, what should we do if the church does not allow us to keep God’s commandments? Jeremiah 44:23-30 makes it clear that we should break a vow if our vow causes us to do evil and disobey God. We will be punished for keeping a vow to sin. We should read Jeremiah 44 all the way and realize that those words are still for us today, that we could be worshiping other gods as well as they were, although maybe in a different way, breaking one of the other commandments. Let us study again what verse 20 says: “And hallow my sabbaths” (the seventh day is the Sabbath of the Lord our God, Exodus 20:8-11, and He never asked anybody to keep any other day as the weekly Sabbath); “and they shall be a sign between me and you, that ye may know that I am the Lord your God.” What sign is it if we don’t keep God’s Sabbath and keep another day instead, and who is then our God? Will we now be thankful enough for the wonderful grace of Christ and love Him enough to keep the commandments of God, and the faith of Jesus? Revelation 14:12. Or will we still cling to our old traditions and obey our church above God like Saul did? 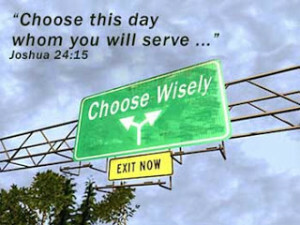 Let us choose the God which Joshua did. ?